Hay move that bale in the way of a boat on the Leeds & Liverpool canal. Nice photo. But, hey, I bet that hay bale is straw. ....and where are their lifejackets ? At least they don't have to bail out. Hello Edward, nice light and shade and looks a fine warm day - when and where is this? No doubt Mick and several other commenters on P-a-D will know the location on the L & L.
What happened next did they push it out of the way with the boat. Bales of hay/straw put in by council to soak up floodwater(haha).Did it fall or was it pushed? Ernest the bridge looks like Bridge 67 Waterhouse Bridge. Just for you, Ernest, it's called Waterhouse Bridge, number 67, and it's on the stretch between Arley and Adlington. We never wore life jsckets when we were boating. They should have had someone at the front with one of the poles to move the bale, as it is they look close to the side of the bridge. How did they manage it? That bale has been in there for a while, after rolling in from the adjacent field. well done edward , i like your wit. Thanks Mick and Jod, you were only two mins.between comments! so won`t have seen each others. Not that I would boast,much,but in sept. I walked from Top Lock to Wigan Pier at age 87, with 2 bad knees. I passed two narrow boats tied together, on their way to OXFORD,taking 3 weeks to do so. 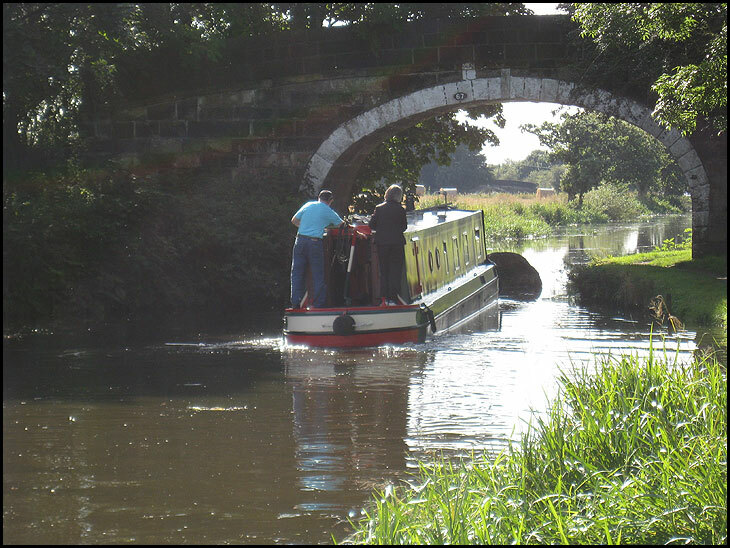 For the worry-worts among us, the standard safety instructions given to folks new to the canals includes what to do if you fall overboard: 'Stand up! '.